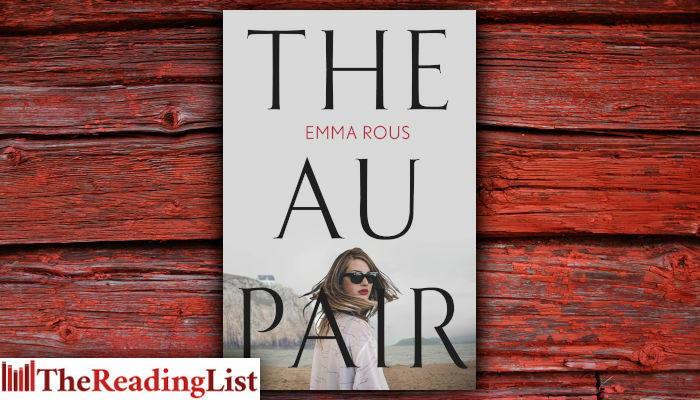 Read an excerpt from Emma Rous’s debut novel The Au Pair – one of the most anticipated books of 2019! The Au Pair is a tautly plotted mystery of dark family secrets. Emma Rous grew up in England, Indonesia, Kuwait, Portugal and Fiji, and from a young age she had two ambitions: to write stories, and to look after animals. She studied veterinary medicine and zoology at the University of Cambridge, and worked as a veterinary surgeon for eighteen years before starting to write fiction. The Au Pair is her first novel. It will be published in 10 countries, in nine languages. It’s a muggy evening at Summerbourne, and the unopened window in the study muffles the distant rasp of the sea and leaves my skin clammy. I’ve spent the day creating paperwork towers that cluster around the shredder now, their elongated shadows reminding me of the graveyard. If Edwin has finished his packing, he’ll be waiting for me downstairs; he disapproves of me doing this so soon, or perhaps disapproves of me doing it at all. The swivel chair tilts with me as I grab another photo wallet from the bottom desk drawer – more landscape shots of my father’s, I expect – and I focus on the wall calendar as I straighten, counting red-rimmed squares. Twenty days since my father’s accident. Eight days since his funeral. The packet flaps open and spills glossy black negatives across the carpet, and my jaw tightens. I’ve lost count of how many days since I last slept. The first photo is of Edwin on the beach as a child, and I check the date on the back: June 1992, just weeks before Danny and I were born. I study this four-year-old version of my big brother for any sign of awareness of the family catastrophe that was looming, but of course there is none: he’s laughing, squinting against the bright sunlight, pointing a plastic spade toward a dark-haired young woman at the edge of the image. Photos of seagulls and sunsets follow, and I shuffle through them until I reach the final picture: a domestic scene both recognisable and unfamiliar. The hairs at the base of my skull prickle, and I hold my breath, and the air in the room presses closer, as if it too is straining to absorb the details. I flip the photo over, and my father’s distinctive scrawl confirms it was taken on the day we were born, just over twenty-five years ago. I already know it could be no later, because on the same day Danny and I were born, our mother jumped from the cliffs behind our house and killed herself. ‘Yeah.’ His tone is soft; his attention absorbed in the picture. ‘Your au pair?’ I ask. Now that he says her name, I’m pretty sure I’ve seen her in the family photo album. The young woman who looked after Edwin in those carefree days before we were born, when he still had a mother and no need of the full-time roster of nannies that Danny and I grew up with. ‘She’s the one who took this,’ Edwin says, reaching again for the photo of our mother holding the single baby, but I keep my grip on it and take it with me to the kitchen table. I drop onto a chair and straighten the picture in front of me, smoothing a curled corner with my thumb. ‘Here,’ Edwin says. ‘I’ll take it – I’ll ask Gran about it.’ He reaches for it again, but I press my thumb more firmly onto the corner. I look up at him. ‘And we don’t know why. And now Dad’s gone, we might never …’ The injustice of our situation – of growing up without a mother and now losing our father in such a senseless accident – comes crashing down on me again. I grit my teeth. For almost three weeks I’ve had my brothers and my grandmother staying at Summerbourne with me, handling funeral arrangements and solicitors and condolence visits. I can’t begin to express to Edwin how desperately thirsty I am now for solitude. I can’t suppress a groan. ‘Oh, please don’t.’ I’d found it awkward enough shaking Joel’s hand at Dad’s funeral; I hadn’t realised he was staying with his grandfather, our old gardener, Michael, just down the lane. His gaze slides away as I shrug. I’ve never felt much need for friendships, never nurtured them, and this baffles my big brother. I think of the phrase Danny uses about Edwin occasionally – ‘he’s not disappointed in you, Seraphine, he’s disappointed for you’ – Danny’s wry tone softening the thorny truth of it. Not for the first time, I swallow down my frustrated response. I’m fine as I am, Edwin. Leave me alone. ‘Get some sleep, Seph,’ he says. Back in the stale air of the study, I switch on the overhead light and eye up the paper towers. An image of a blue company logo niggles in my memory. I start on the documents that I cleared from the bottom drawer of the filing cabinet this morning, and within five minutes, I’m holding the au pair agency form – faded ink on flimsy paper. She appears in only half a dozen pictures. The clearest is labeled Edwin with Laura in my mother’s spiky handwriting, and as I tilt the page to peer at it more closely, the ancient adhesive gives up, and the photo slides free of its transparent cover and into my hand. I gaze at Laura’s image. In the other pictures, she’s on the margins, glancing away, the focus on Edwin and frequently his best friend, Joel. In this one she smiles at the camera as she holds Edwin’s hand in front of the rock pools. She’s tall, athletic, with a mass of dark hair tied back. The agency document says she was taking a year out to repeat her A-level exams following ‘difficult circumstances at home.’ I study her face. Were there complex emotions within her smile? To me, she simply looks happy. It was never a taboo subject exactly, my mother’s suicide, but we were only given a limited amount of information as we were growing up. Seeing her in this picture, gazing calmly down at her indistinct bundle, contradicts everything I’ve ever imagined about that day, and reminds me forcibly that there’s no chance now of ever hearing the full details from my dad. But if Laura was there – if Laura saw what happened between this photo being taken and our mother jumping – perhaps I don’t have to spend the rest of my life not knowing after all. I shove the previous night’s nest of sheets off the bed and stretch out flat on my back, my fingers splayed, as I wait for a hint of breeze from the open window. Inside the red-black of my eyelids flicker the faces of children who were a few years above me at the village school-sly-tongued kids who used to call us the sprite twins, and ask me repeatedly why I didn’t look like my brothers. Vera, my grandmother, used to tell me they only taunted me because I reacted with fury, unlike Danny, who could shrug any teasing off with a laugh. Bird chatter rouses me, creeping through my window with the first rays of sunlight, and I’m not sure whether I was asleep a moment ago or just lost in my thoughts. A plan is already unfurling behind my gritty eyelids. By seven o’clock I am showered and dressed, with more energy and purpose in my limbs than I’ve felt in the three weeks since Dad died. I tap Laura’s old postcode into my GPS and join the flow of traffic from the coast to the capital, a three-hour journey that often swells to four. Laura’s old address turns out to be a neat terraced house with a semicircle of brightly stained glass in its front door. There’s a small park across the road, surrounded by green painted railings that gleam in the late morning sunshine as if they’ve just been polished. I hesitate on the pavement, imagining suspicious eyes watching me from behind the pristine net curtains. For several heartbeats I consider walking away, but I grit my teeth and knock. ‘You from that posh family she used to live with?’ he asks. ‘Wait there. I’ll get her mum. She knows where she works.’ He shuts the door in my face.